Summer is here. We will have more beach or water play time. As parents, if we have little babies, we always worry about them being exposed to sunshine too much. 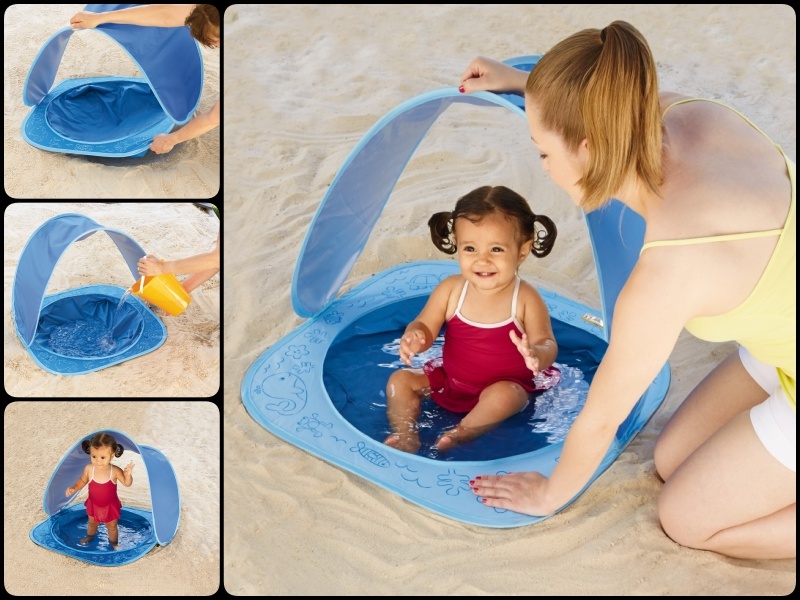 Baby Beach Shade Pool is a great idea to enjoy beach time with baby without having to brave the crashing waves. It makes playing in the water safe and shaded! This Baby Beach Shade Pool is easy to set up. Within moments, your baby is splashing happily in his or her own personal beach pool! Cool off at the beach without having to brave the waves! Shade features UV50 protection, pool features max depth of 6 inches – Exceptionally safe! Maximum water depth is 6″. Use only with adult supervision at all times. Empty and dry both pool and shade. Fold each to fit back into storage case at the end of beach time.